Packing errors can arise for everyone from frequent flyers to the travel enthusiast who is just getting started. Leaving behind your camera or even simple things like your headphones can adversely affect your mindset during your journey. To top it off, the best experiences tend to arise when you are least prepared for them. Naturally, we have created a comprehensive travel packing list to ensure you never forget important things like your credit cards, wallets, passports as well as comfort related things like pillows & blankets. 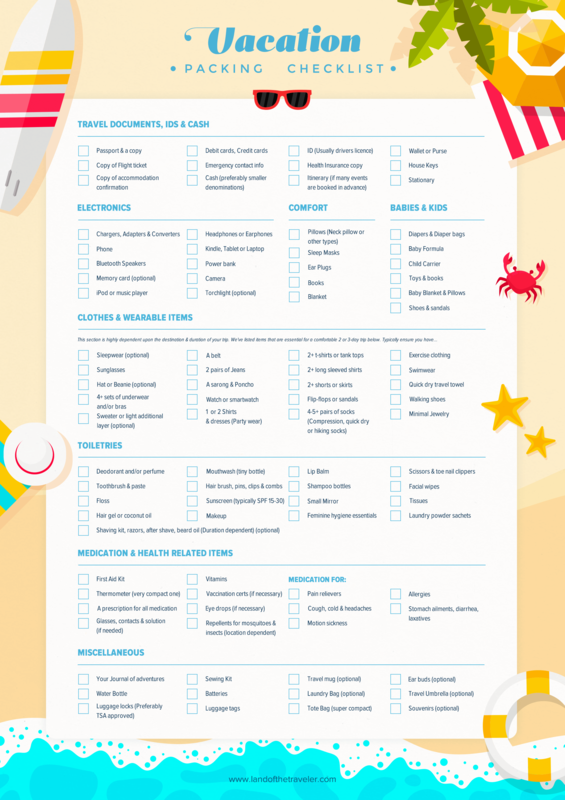 This is a generic vacation packing list that will be perfect for individuals, couples, and families too. It can be quite easy sometimes to overlook packing organizers. In reality, they do make life so much easier. Packing cubes of multiple sizes (4+ is ideal) can ensure your items stay protected especially if you happen to have a major shampoo explosion. Staying organized can save you precious time when unpacking and you will know exactly where all the little items are. Another advantage is that the cubes offer great compression on bulkier items like sweaters. While neatly packing your clothes can save space if you’d like to pack efficiently you should roll your clothes. Rolling your clothes has two benefits, you can save space and reduce wrinkles. The often forgotten item in this section is Stationary. It’s quite common to see people running around trying to find a pen to fill out the inbound immigration cards. Make sure you have easy access to a pen at the very least. Plus they come in handy for crossword puzzles. Ensure you have a good anti-theft bag or neck wallet that keeps your belongings safe at all times. The RFID threat is not as significant as it was in the past so it’s not a necessary feature but still good to have. Make sure you have charged up your phone, camera beforehand. Also, make sure your memory cards have enough space to take many awesome pictures. Typically the ones in the first 3 sections constitute most people’s carry-on items. Try to make sure you have a copy of our ID in your main luggage in addition to your wallet. Having a TSA compliant toiletry bag makes things easier. Toiletry bags are usually waterproof and follow the 3-1-1 TSA rule for liquids, gels, aerosols etc. Also if you are on an inbound flight make sure you have the receipt for any duty-free liquids you bought within 48 hours. Before you travel make sure you need or don’t need to get vaccinated to visit a particular country. Also, it’s always good to check if there are any travel advisories for your destination. If you are carrying things like eye drops or antibiotics its best to have a prescription with you. #Note: If your trip includes extensive backpacking & high altitude trekking then you will need other medication too. Have a look at this comprehensive backpacking medical kit list and some rules for providing care. It’s always good to carry an extra bag if your carry-on happens to be a suitcase & not a backpack. Even though it’s not a tangible thing, it’s good to download apps that folks use often in the destination country. It’ll help you socialize & get around much easier. Also, it’s much better to take a tiny travel umbrella beforehand instead of arriving and buying a super expensive option just to get out of the airport without getting drenched.